After 10 days lolling about on the beach, exposing ourselves to far too much alcohol, food and sun my husband and I were collected by Lulu and Skip to begin the next part of our holiday. We squeezed into their dust covered 4 wheel drive…they’d come up, thousands of kilometres, through the dry red centre of the continent (hence the dust) and were loaded up with enough gear to last the entire trip (ditto the ‘squeeze’). 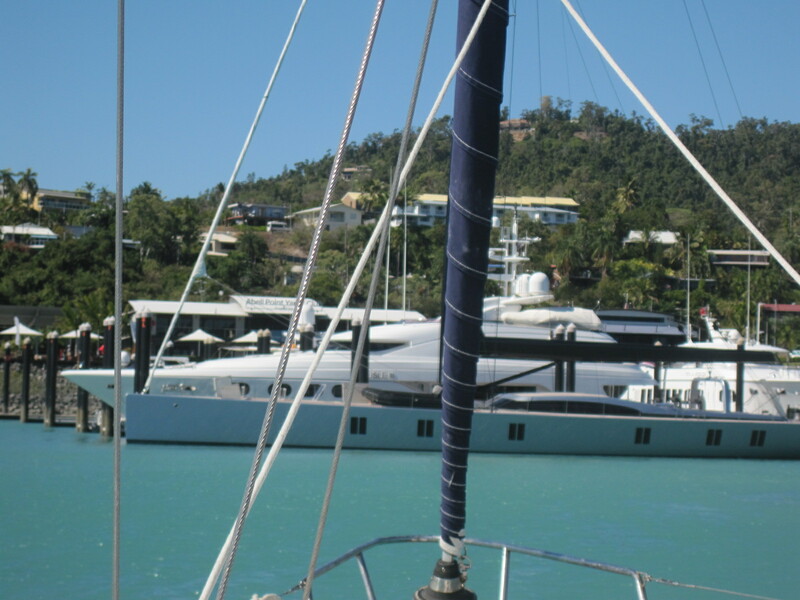 By nine that morning we set off on the 700 km journey down the east coast of Australia to our next destination, Airlie Beach, where we would board our yacht. 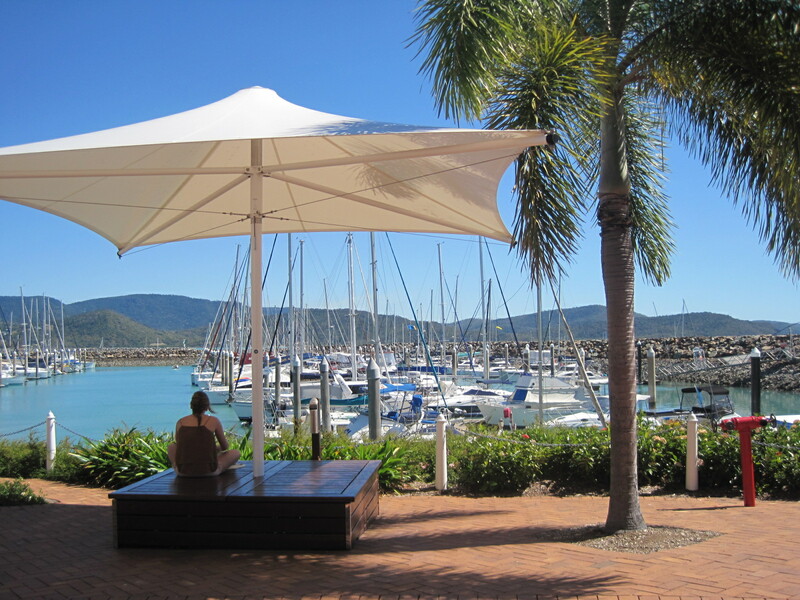 Holiday apartments, a sheltered harbour, blue water and lots of boats suggested that, after many long hours on the road, we’d finally arrived. The sat nav took us to the top of a hill and we looked down to see where we were actually meant to be (bloody stupid device, I much prefer paper maps)…eventually we made our way down to the marina!? 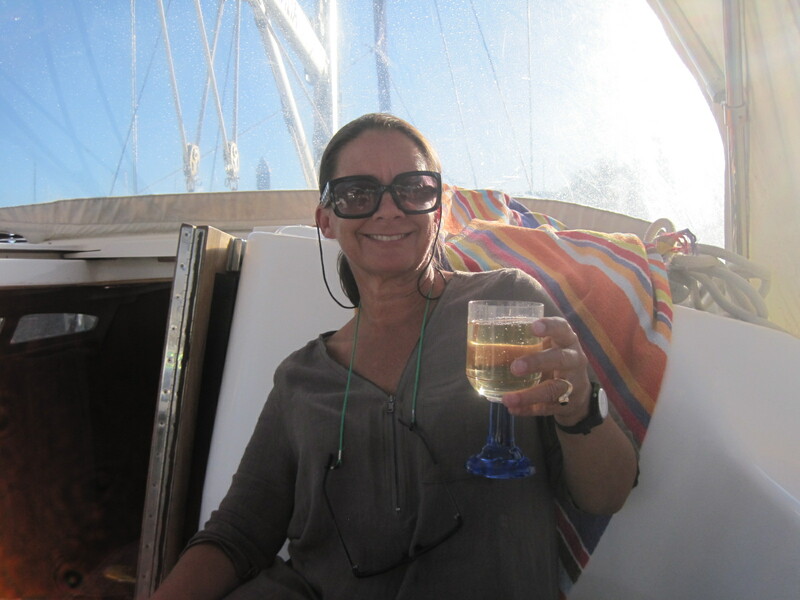 Lulu found the Charter HQ, our yacht and Bruno who handed over the keys and welcomed us on board. There was so much to be learned, I could barely take it all in as Bruno gave us instructions on how to use this big floating toy… I hoped the other three were all paying attention. The biggest lecture and most thoroughly emphasised points were the toilet rules. Only 3 toilet rolls would be supplied, not because the company was stingy but because the entire sanitary system would be blocked if we overloaded the loo with too much paper! We were told to use only a couple of sheets of the specially designed marine grade paper, to scrunch not fold and flush for at least 10 seconds after we’d finished. 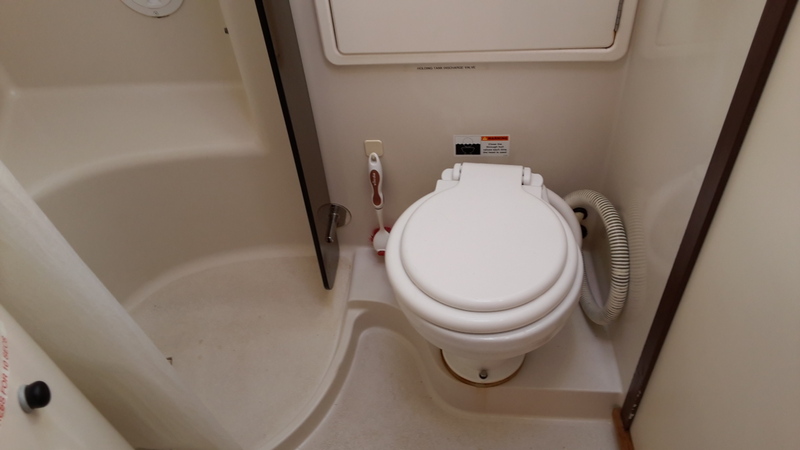 Under no circumstances were we to put anything, other than the 3 P’s, down the temperamental system… especially not the triple layer supasoft toilet tissue we’d brought on board! It all got a bit uncomfortable, none of us could imagine surviving on 3 rolls for 8 nights and it gave a whole new meaning to the term anally-retentive! Bruno told us not to worry, everyone freaks out at first and he’d had very few failures in the past…the overflowing bathroom or the cost of having the system unblocked was enough for us to take his warning seriously. We all vowed to make the most of the marinas toilets before we set sail tomorrow morning! Bruno continued the tour showing us how to use the radio, when to call in (8.30 am and 4 pm) and suggested we appoint an official radio person…”Aye aye Captain!” and thank-you very much Lulu…we would all have our assigned tasks. Finally the tour was over and we were left alone to contemplate the massive amount of information we’d been given. Skip was a very experienced sailor and I had every confidence he’d understood all we’d been told. It had been a long drive and, after Bruno’s info session, was too late to take the boat out. 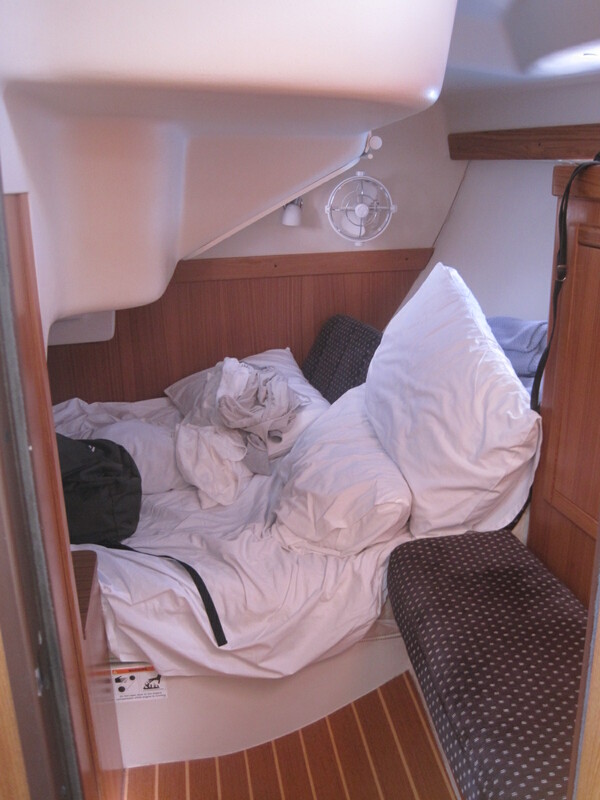 We were in no hurry and had planned to sleep on board, in the Marina, on our first night, to get a bit of a feel for the boat and get used to being at sea. But none of us could contemplate drinks, bed and a good nights sleep just yet as we needed to buy provisions before the supermarket closed. I was the cook and did a quick meal plan. We’d be on for 8 nights, 3 meals per day, multiplied by 4 people. That’s 96 meals! First night was easy, we’d eat at the Italian restaurant on the Marina, our last meal on land before our epic sea adventure began. For the remainder of the time I decided on 7 meat/vegetable/ carb main meals. Cereals, toast, eggs and bacon for breakfast. Lunches would be cold cuts, salads, sandwiches and antipasto. 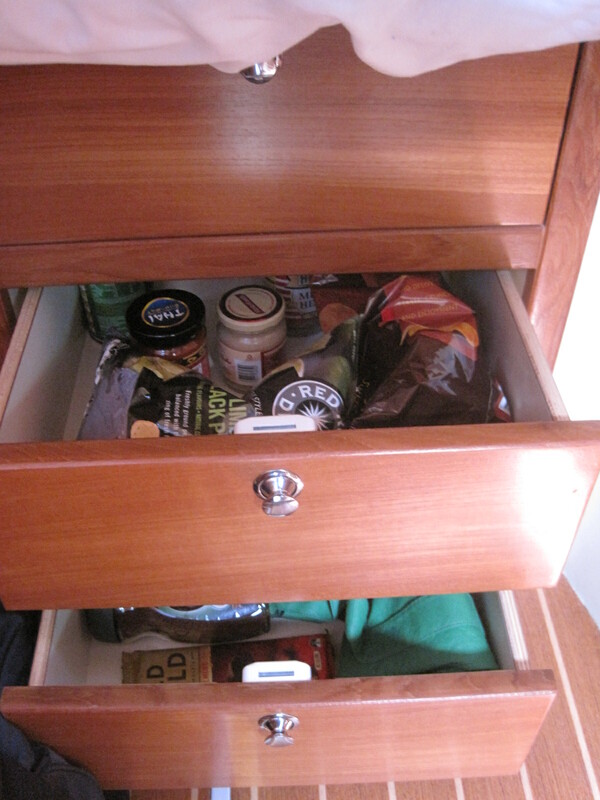 And of course there would be all the usual extras such as coffee, tea, milk, chips, chocolate, fruit, nuts, etc, etc. 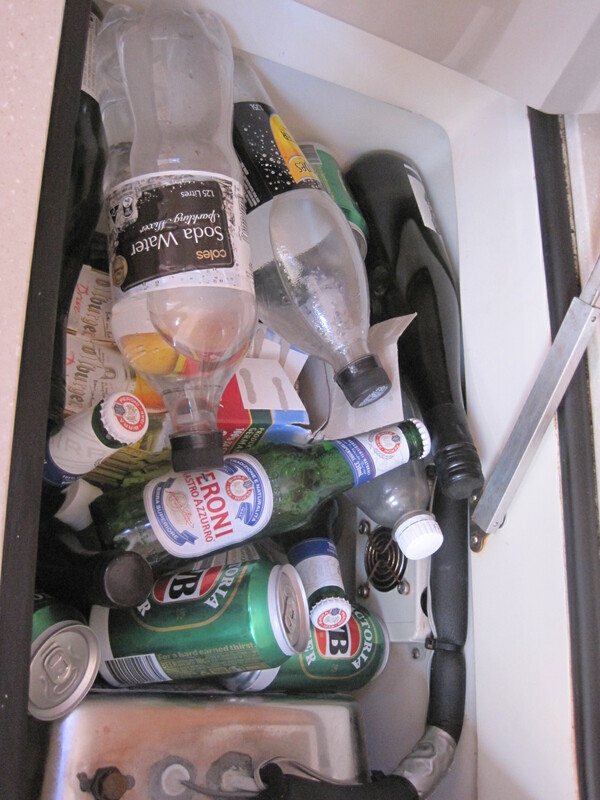 I also stocked up on tinned goods just in case we couldn’t cook or the refrigeration failed. There were no shops at sea so I planned for every possible scenario. An hour later and carrying bags full of groceries, we returned to the boat with a crazy amount of food. The thought of running out was terrifying and some saying about a ‘crew running on its stomach’ kept haunting me. 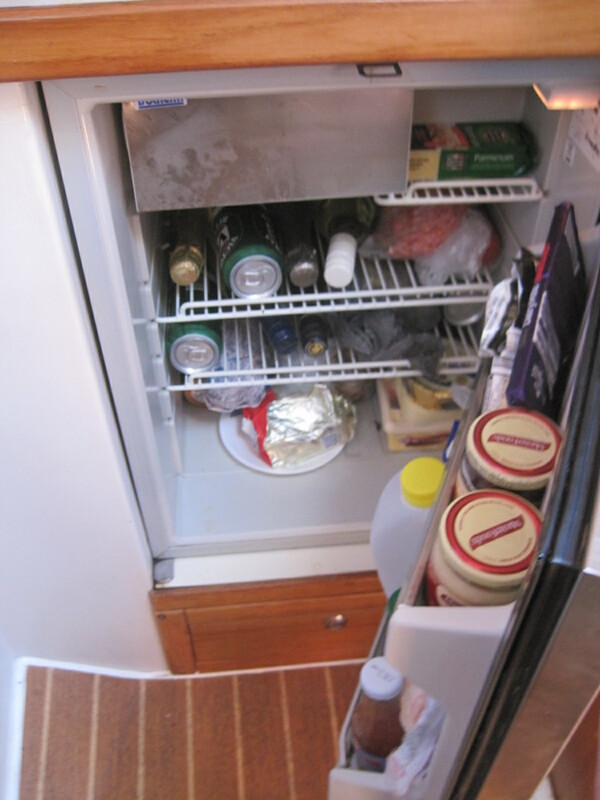 The tiny little fridge could barely cope! The kitchen was packed full. Keeping things in boxes on the floor would never do. Everything had to be securely stowed (yes Bruno, I’d been paying attention!) before we hit the high and very unstable seas. What to do? We’d packed very little clothing, swimwear, sarongs and shorts, so we filled the empty drawers and cupboards in the bedrooms with the remaining food. Unlike my cruise ship experience, we wouldn’t need dinner jackets or glittery gowns for any black-tie dinners. This was not that kind of ship (and we couldn’t have afforded one that was anyway)…although I couldn’t help but notice the huge super-yachts, not so far away, where I imagined the guests would be dressing for dinner about now. I would need to sell a bloody lot more books before I’d be invited on board to share a meal on boats that big! The boys did the booze shopping and loaded the freezer with all the essentials. 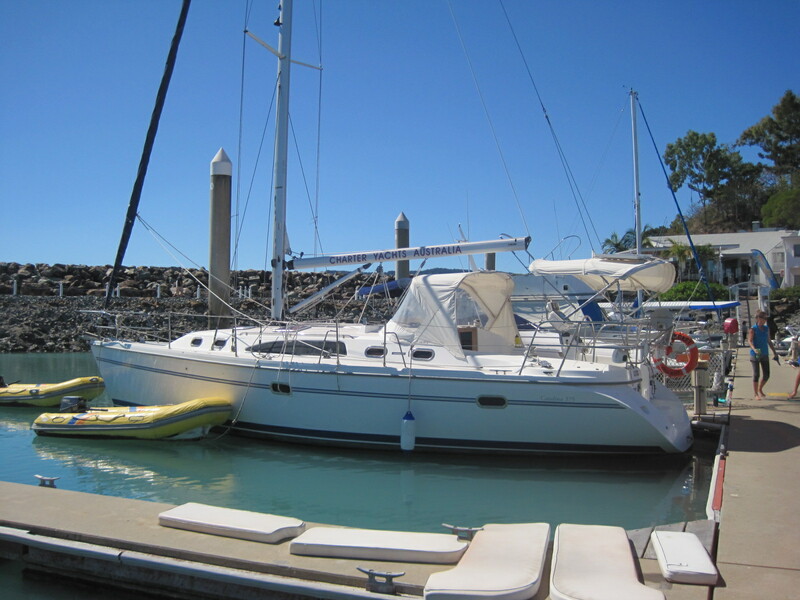 I walked up to the restaurant on the Marina only to be told the place was fully booked with had no chance of a table…it looked like I would begin galley duty that very night. 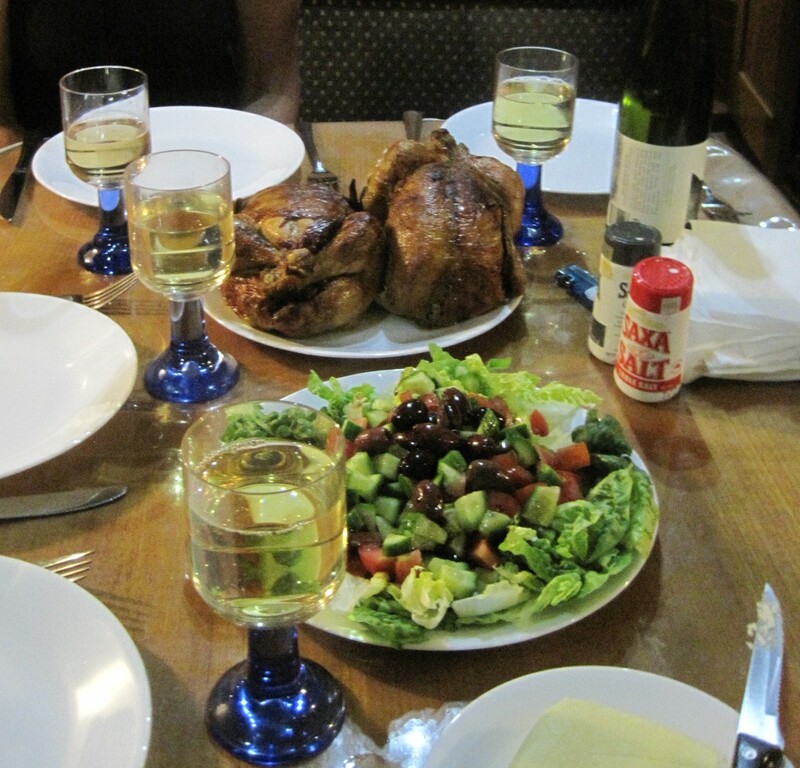 Luckily I’d bought 2 supermarket chickens and that would be our first meal. Not very exciting but a quick way to feed a now very hungry crew! Pleased with our efforts and the great ease at which we’d settled so naturally into ship life, we wolfed down the food, opened bottles of wine and talked excitedly about what the Whitsundays might offer…tropical islands, white sandy beaches, clear blue water, coral reefs, and a plethora of sea creatures. I couldn’t wait! It had been a peaceful night. 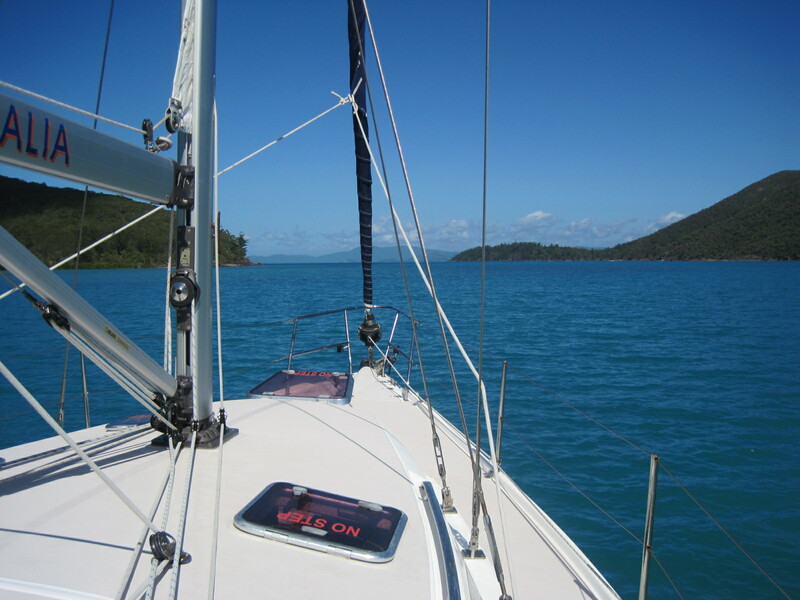 We’d been lulled to sleep by the gentle rocking of water… and two more bottles of champagne. 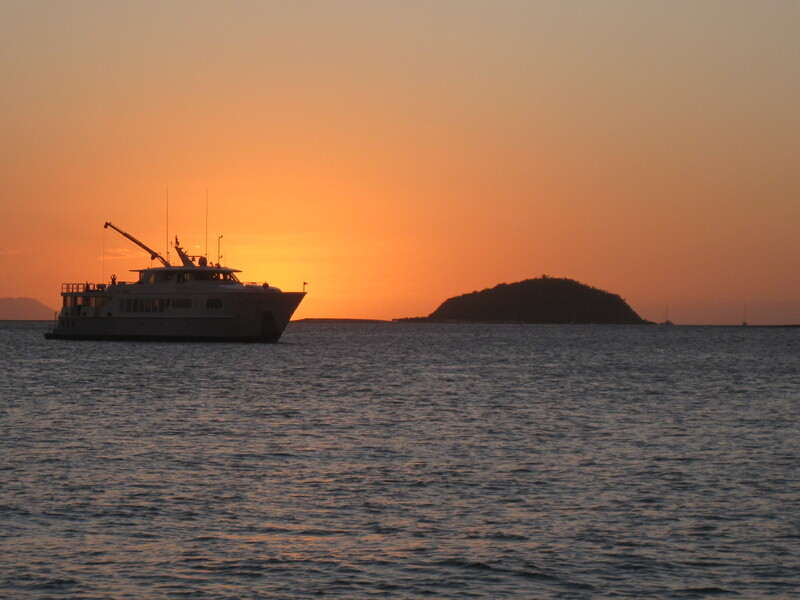 I got up early the next morning (we still had lots to do before setting sail) and took this shot, at sunrise, of the boat, ‘Rocket’, that would be our home for the next week. 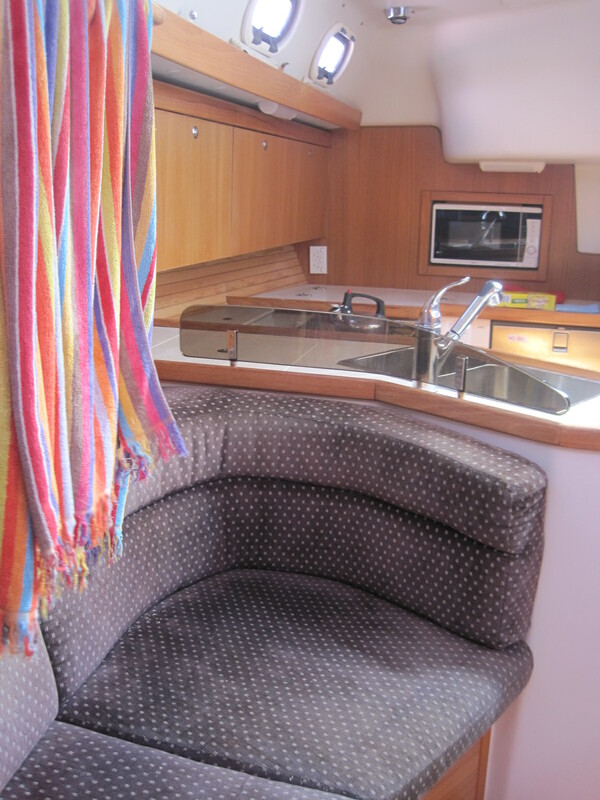 Ours was no super-yacht, more a floating caravan…but perfect for 2 couples. This was our bedroom, tucked under the front deck. The messy bed was not the result of too much research (quite frankly the quarters were far too close) it’s just that my husband is a very restless sleeper! Lulu and Skip’s bedroom was at the pointy end…I think that’s the term? And in between was a comfy lounge and dining room with a kitchen tucked to one corner. 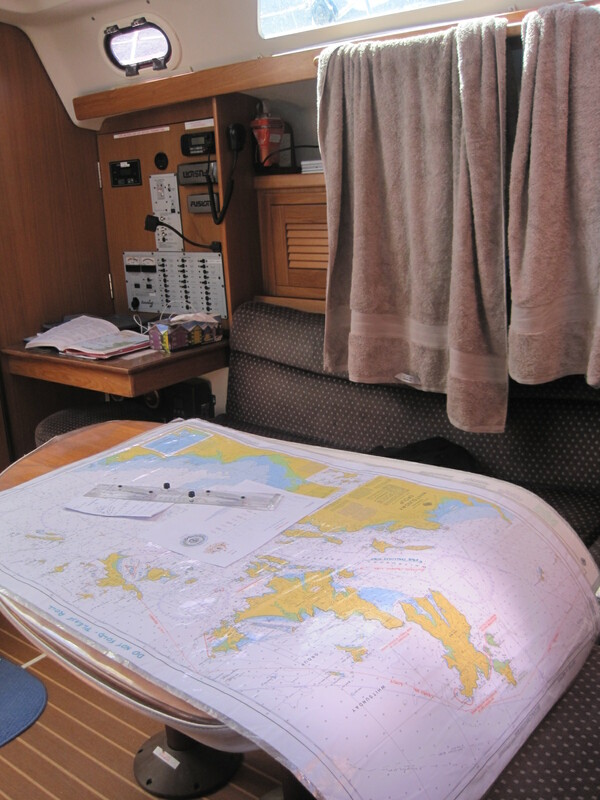 After breakfast we spread the charts over the dining table and plotted a course. 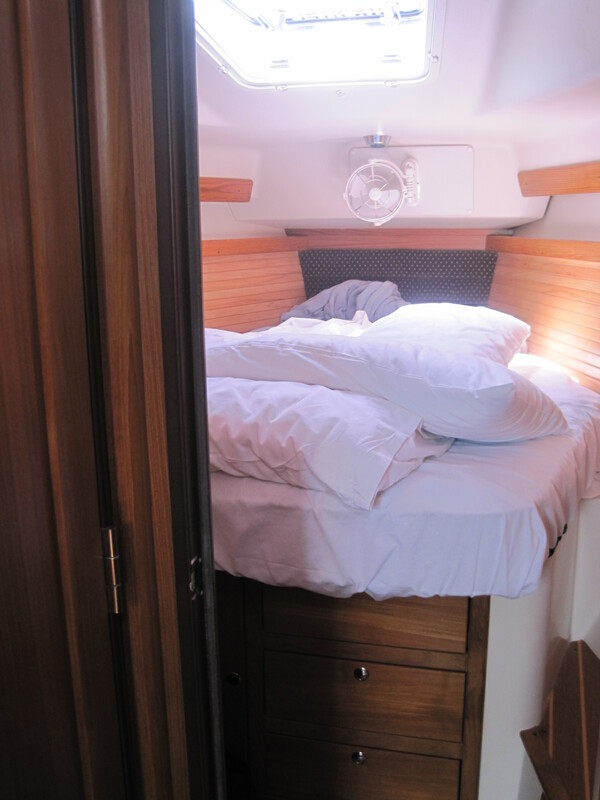 We did a bit of last minute stuff… long, hot shower in marina bathroom (and much needed use of toilet! ), snorkeling gear hire and lots more ice. Sam (our instructor) jumped on board to give us our lesson and by 11 am he was confident we would be fine, Skip really knew what he was doing. Giving us the ‘all clear’ Sam jumped into his dinghy, leaving us alone and heading out to sea. 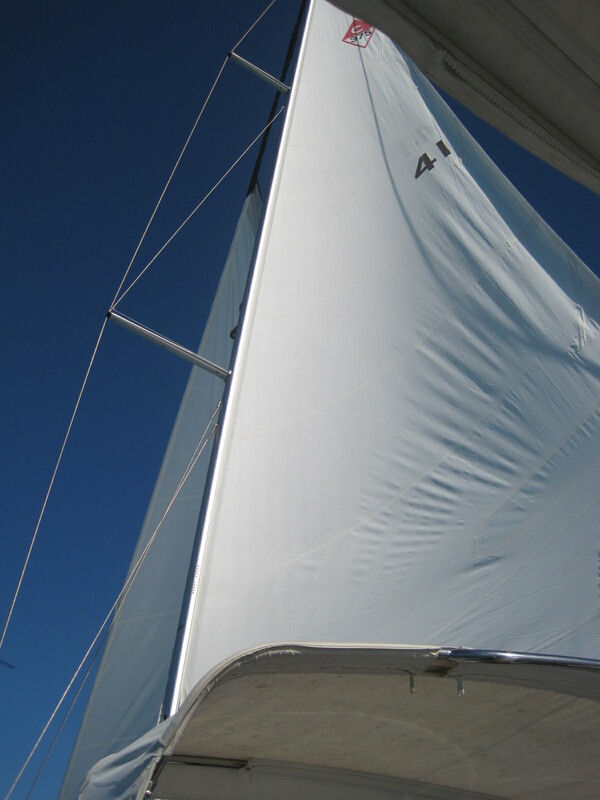 He gave us instructions and eventually, we, his unco deckhands unfurled the sails, cut the motor and whoosh, we were off. It was all a bit amateurish and I’m sure Skip was wondering what kind of crew he’d been landed with! 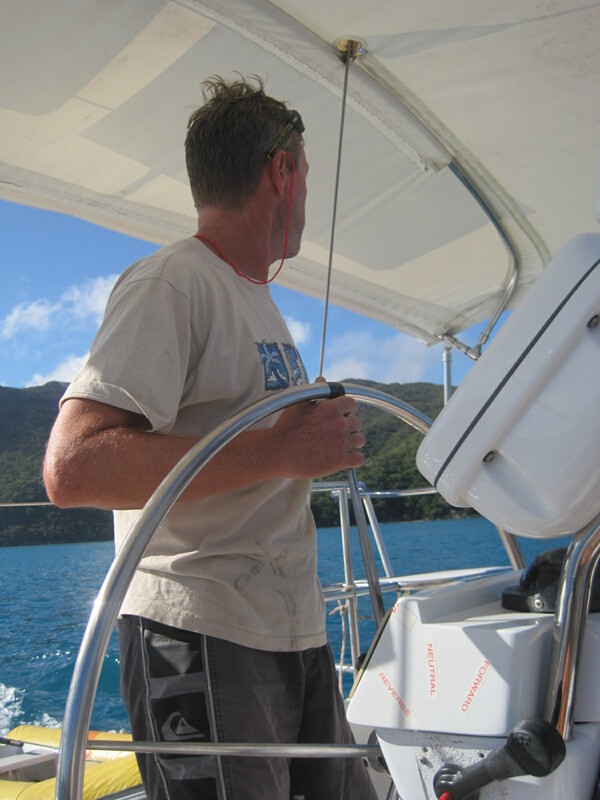 We spent the next few hours sailing to our first destination, not quite taking in the scenery, all a bit nervous and nowhere near as practiced or confident as Skip. Every boat that went past I thought we would hit, every dark patch of water was surely a perilous reef and every extra cloud or puff of wind was most definitely the beginnings of a storm! Were we really ready for this? By late afternoon Skip had safely found a sheltered cove. 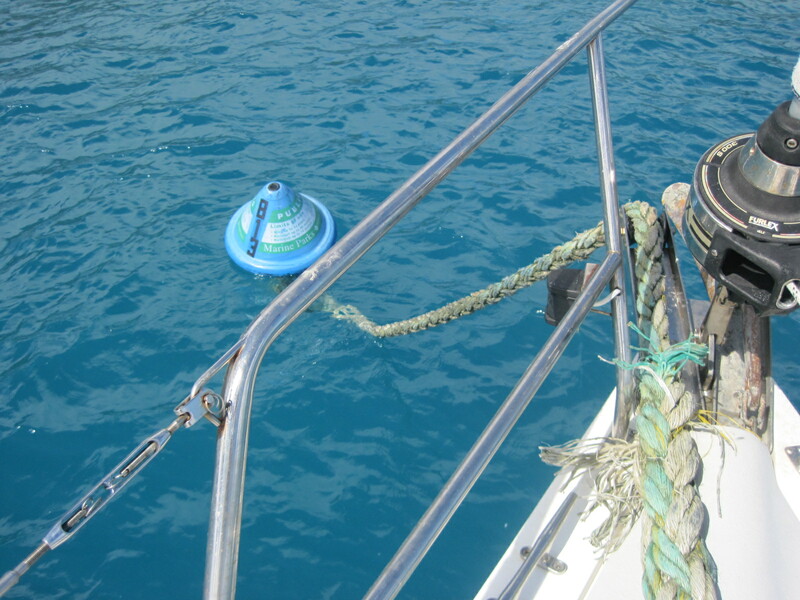 We found our blue mooring buoy and after a few attempts finally secured the boat! 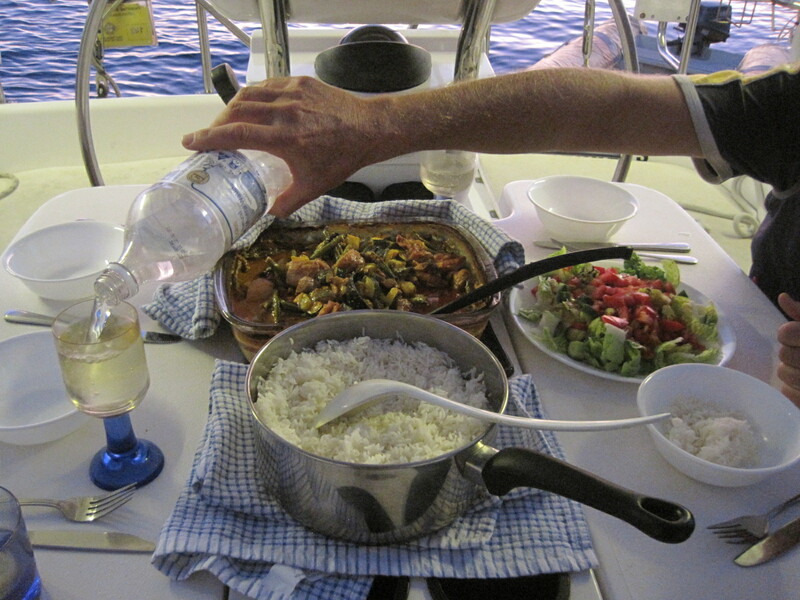 At this stage I realised that, although I loved being at sea, was the worlds most useless sailor so I retreated to the galley and did what I knew best…and cooked our first proper meal of a Thai red curry, rice and salad. Skip topped up my wine with a little soda water and I guzzled it down, rehydrated and ready for a real drink! I was surprised at how thirsty and tired I was. Skip said we’d all done well. After a few more wines we paused and looked around. 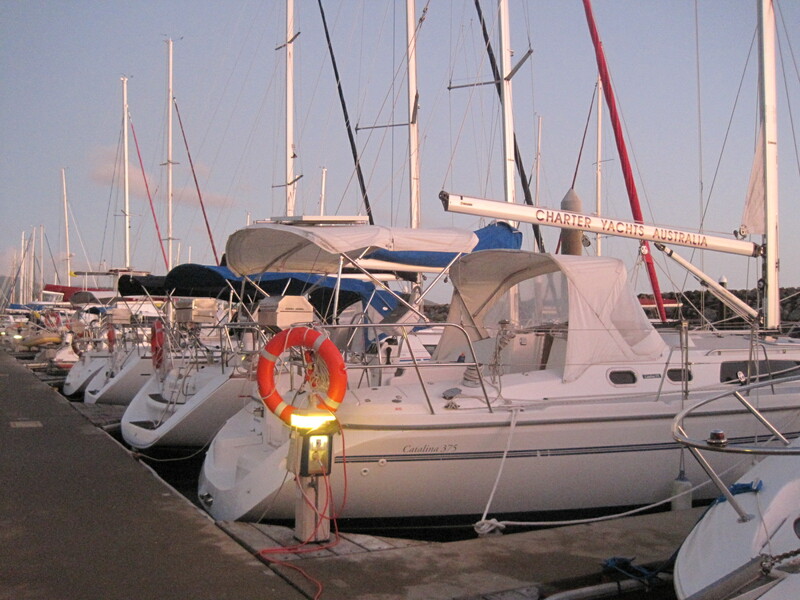 A very big boat had pulled in, there were no sails and we pooh-poohed this motor craft, declaring that being on the sea was about wind and sails, the way we did it …not about loud chugging motors and hired captains…by 8 pm we were experts…and very, very ready for bed! Coming up…part 2 and losing a camera overboard!